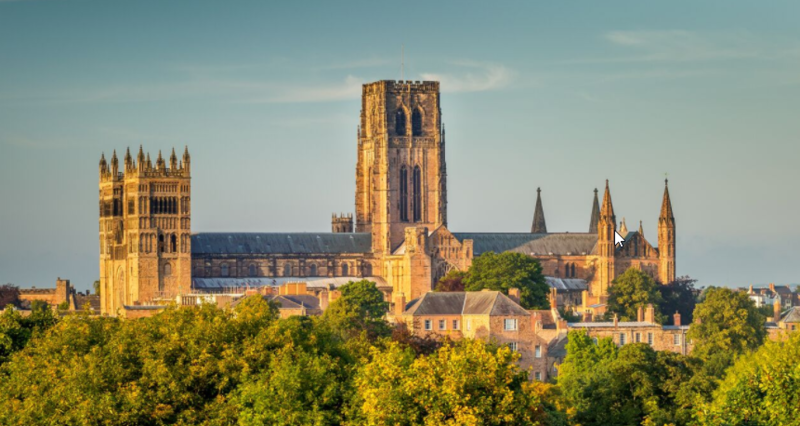 Founded in 1093 and the final resting place of St Cuthbert, Durham Cathedral remains the seat of the Bishop of Durham, the fourth most senior cleric in the Church of England. As well as being the North-East home of the Magna Carta, which was taken to London during the Reformation and now makes occasional trip back to the north, the Cathedral and its environs have also featured in numerous Hollywood films including the Harry Potter franchise. 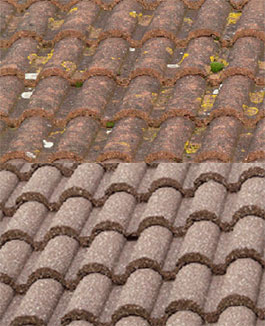 Moss on roofs is a common problem for older and cherished buildings. Such roofs are likely to be well into their predicted life span and aggressively cleaning ageing roof surfaces is not advisable. One treatment, developed and adapted to suit the weather conditions prevailing in the British Isles and Ireland, is AlgoClear Pro Softwash. Formerly known as MossGo, it is non-aggressive in nature. According to suppliers Thames Valley Specialist Products Ltd, AlgoClear Pro Softwash gently cleans and restores old roofs to their former beauty without causing the physical damage that results from pressure washing. Its active ingredient is a quaternary ammonium, which has a rapid breakdown rate after use, leaving residues absorbed by bacteria. Tudor Roof Tiles Co Ltd, Britain's foremost independent handmade clay roof tile manufacturer, has scooped a win in the first ever national Pitched Roofing Awards. 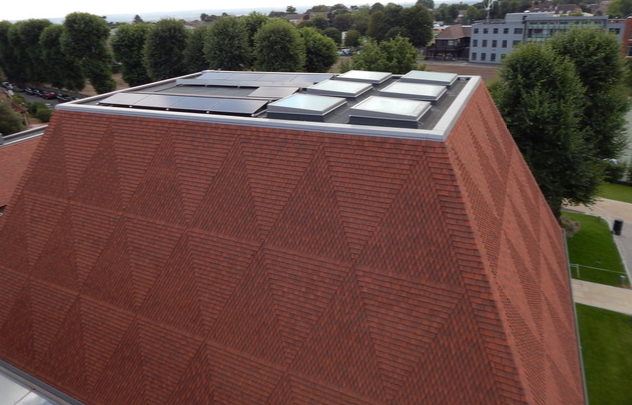 King’s College Music School, Wimbledon, was proclaimed outright winner in the best ‘Commercial Property Application using Roof Tiles’ category using Tudor Roof Tiles working with Avonside Roofing Group. 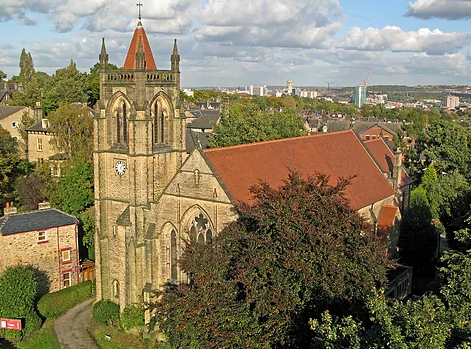 What it lacks in height, the spire at St Augustine’s Church in the Endcliffe area of Sheffield certainly makes up for in distinction. Clad in an unusual red tile, the octagonal 35 metre spire – or spirelette as it is officially called – makes a curious landmark on the city skyline, drawing the eye to what lies beneath and announcing its presence among the plethora of grey roofs and chimney pots nearby. 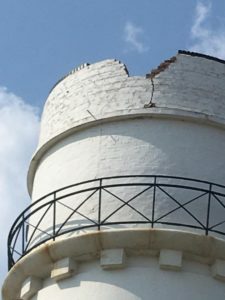 An estimated 18.7% of all listed buildings were physically affected by crime in 2017 - that is over 70,000 listed buildings. 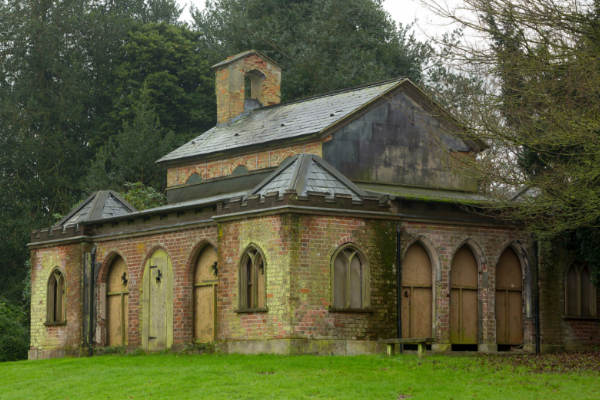 The biggest single threat is metal theft and the most threatened type of building is a church. 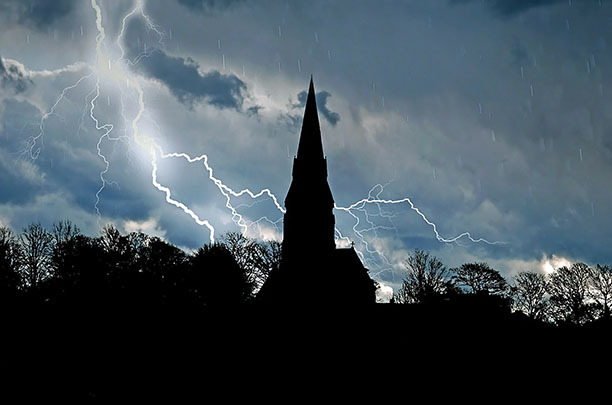 Around 3 in 8 churches or other religious buildings were damaged by crime last year. 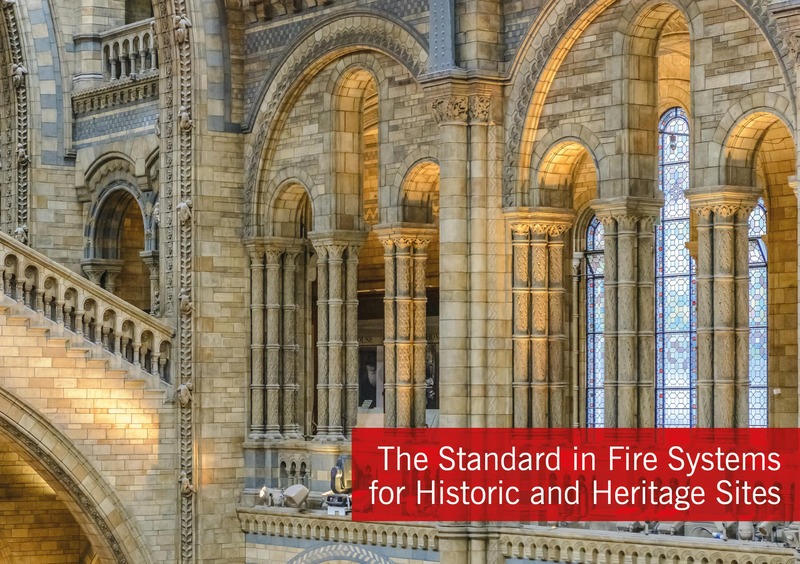 Panthera Security is the UK’s first ever NACOSS Gold Accredited installer of NCP115 Compliant scaffold alarms and they are specialists in the installation of alarm and CCTV systems to listed and religious buildings whilst repair works are being carried out. Part of Panthera Group, the company has been a leader and innovator of the scaffold alarm industry since 2003, when managing director Neal James recognised that there was a need for regulations and standards within this niche sector of the security market. 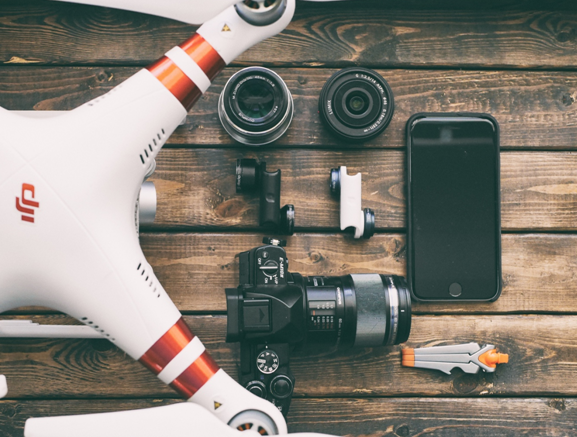 In 2012 Panthera collaborated with the National Security Inspectorate (NSI) to develop the industry’s first ever code of practice. 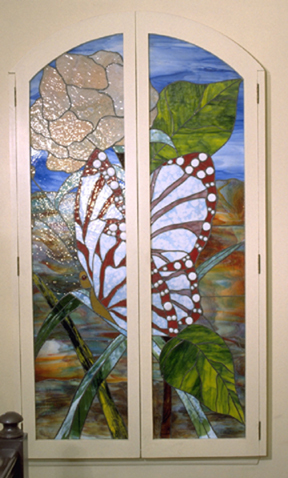 Having designed and made stained glass for many different situations including private houses, churches, public houses, exhibitions and galleries, Ann Sotheran derives the most pleasure from working in close consultation with the client or donor in the initial stages of the design. I like to explore, with them, their reasons for commissioning a piece of work in order that I can develop images which will most closely reflect their feelings and aspirations and evoke a positive response to the finished piece. 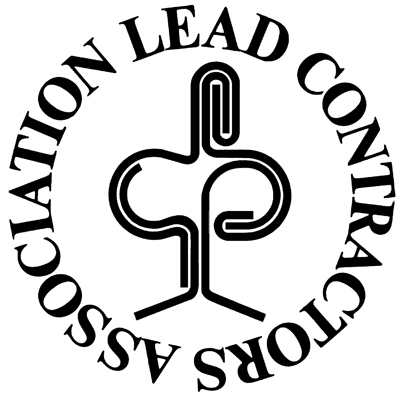 One of the companies that had reason to be glad they exhibited at the last CRE in Manchester five years ago is Anthony J Smith (Glos) Ltd. 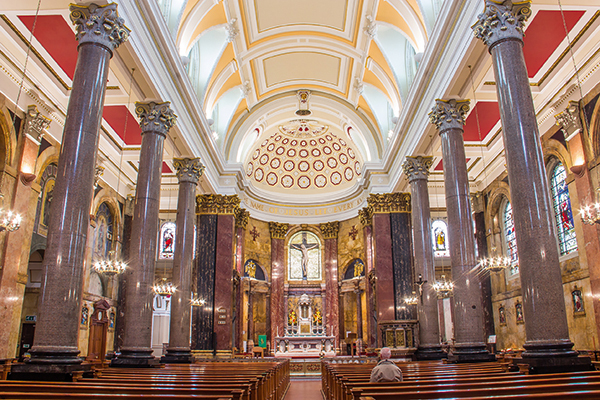 They have a long history of designing and installing bespoke lighting systems within churches and since that last show they have been fortunate to have been involved in a number of church projects in the North West – including at Standish, Ecclestone, Preston and Oldham. 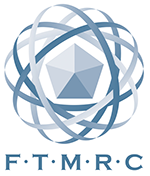 They also have a small number of other projects in the region at the planning stage. That being the case, the company felt that, when CRE decided to return to the North West in March, they should do the same, and they are looking forward to discussing potential new projects with visitors to the show who may be looking either for lighting improvements or for a full design, rewire and installation service. 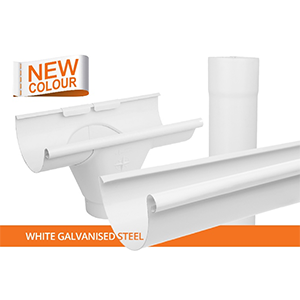 Rainclear Systems, the UK’s leading specialist metal rainwater system stockist and online retailer are adding a NEW colour to their durable, affordable and sustainable Infinity Galvanised Steel rainwater system. Infinity is innovatively designed to be as easy to install as the usual materials used in the UK without the need to solder or rivet. Lengths are just as easy to handle and to cut to size without any specialist tools or equipment. Looking for some useful tips on Natural stone? There are obviously a wide variety depending on what its end use is. 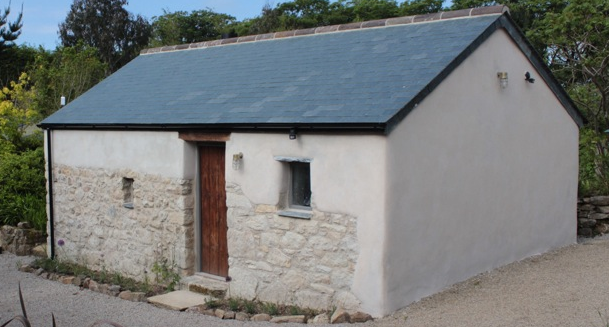 Peter Dunn of Weldon Stone gives some examples with technical specifications and images of the products they have available. You can choose from everything from paving stone to stone for fine carving. From window sills to copings. From Lime stone to Headstones. 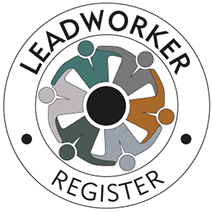 Dreadnought Roof Tiles, one of the UK’s oldest and well-established manufacturers of traditional clay roof tiles, has won the heritage category in the first ever ‘Pitched Roofing Awards’. 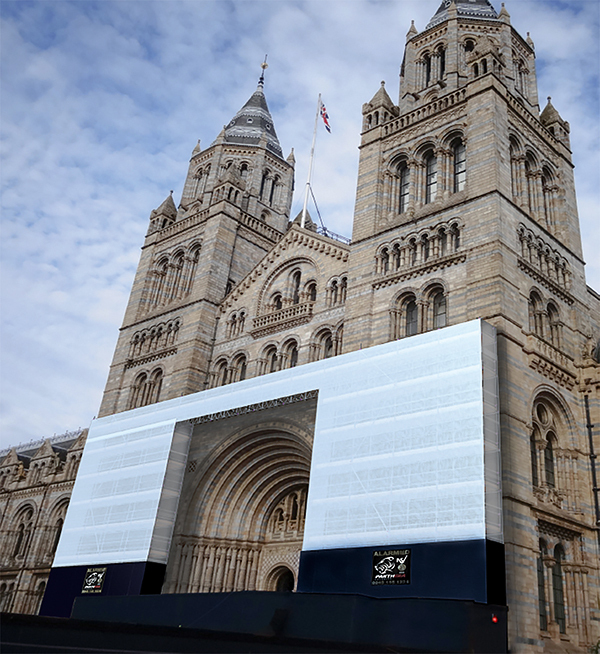 Organised by RCI magazine, these national awards showcase excellence in the roofing sector, highlighting successful partnerships between manufacturers and contractors and recognising commitment to quality. 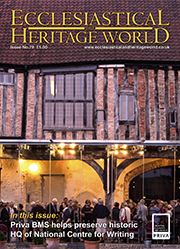 Recent work carried out by the Ipswich branch of Bishop & Son Organ Builders has included a historic restoration of the 1876 Bishop organ in the Church of the Holy Angels, Hoar Cross, Staffordshire. The organ was returned to as near as possible the original specification dispensing with later additions and alterations by the firm of Conacher Sheffield in 1934. 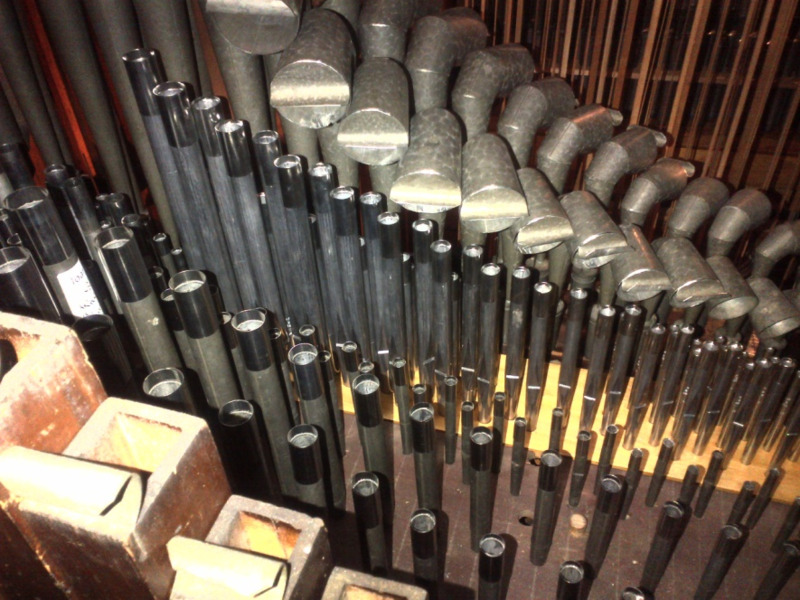 The organ contains pipes from the Samuel Green organ made for Bangor Cathedral in 1799. The Steeplejack and Lightning Protection Training Group (SLPTG) recently celebrated National Apprenticeship Week (4 - 8 March 2019) by hosting its annual Apprentice Awards ceremony. Members of SLPTG gathered on 7 March 2019 at the Park Plaza Nottingham to celebrate the success and outstanding achievements of apprentices within both the steeplejack and lightning protection industries. SLPTG are proud to announce the winners of the Apprentice Awards 2019. 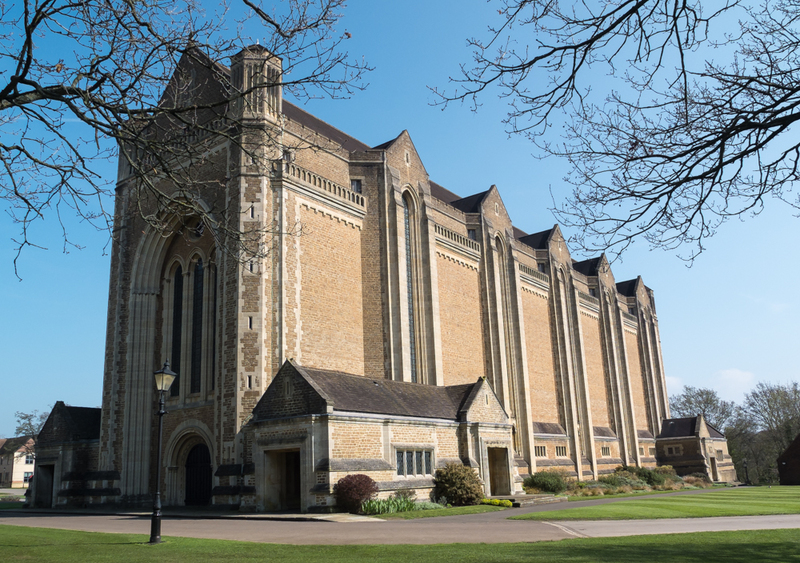 Scanaudio have carried out a major upgrade to the sound reinforcement and induction systems in the Memorial Chapel at Charterhouse during the Easter Holiday. 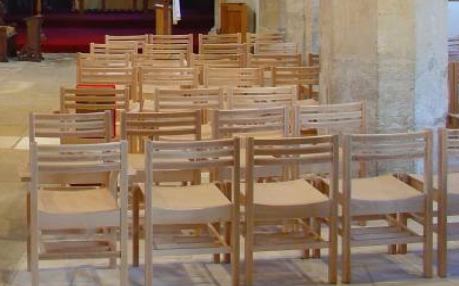 The chapel was designed by Sir Giles Gilbert Scott and consecrated in June 1927. It is the largest war memorial in England and dedicated to the Carthusians who gave their lives in the First and Second World Wars. 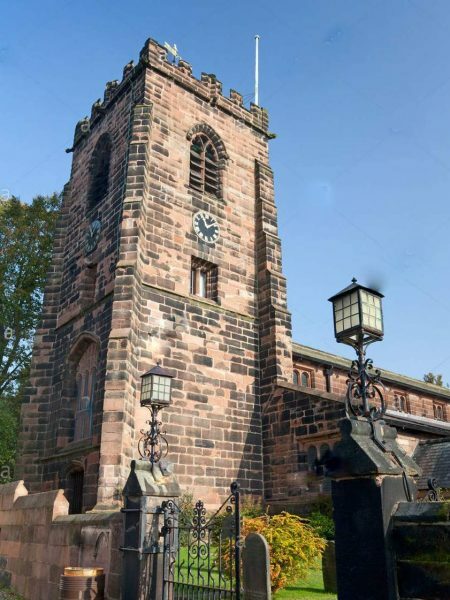 An order has been placed by the PCC of St Wilfrid's Parish Church in Grappenhall, Cheshire for their ring of eight bells (tenor 11 cwts) to be removed from the tower, together with its bell frame and all fittings. A new ring of ten bells, with a similar weight tenor bell, will be cast, tuned and hung in a newly constructed bell frame with all new fittings by Loughborough-based James Taylor & Co - some of the existing Taylor 'H' side frames will be re-used. Four of their existing bells (3, 4, 6 & 7) were cast by Henry II Bagley in 1700 and are listed for preservation. These bells will be conserved, and rehung for chiming above the new ring of ten. 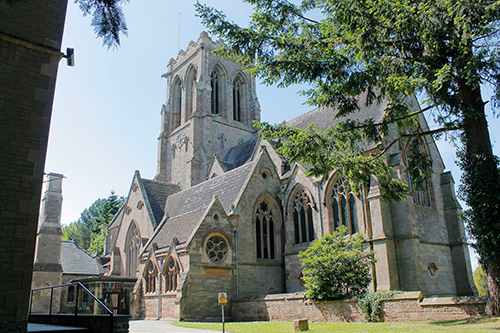 Belmont Abbey, just outside Hereford, is a Roman Catholic Benedictine monastery which also serves as a parish church for the local community. 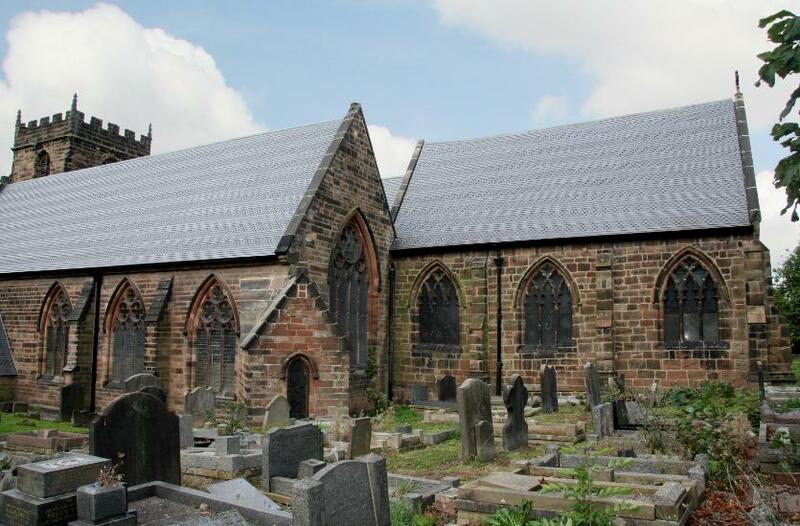 The abbey church is a Grade Two*-listed building dating from 1860. 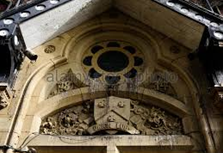 It was designed by Edward Welby Pugin, son of the celebrated architect Augustus Welby Pugin, and is noted for the quality of its sculpture and stained glass. As with many buildings of it age, the abbey had various dampness problems that required constant attention – rising, or structural, damp being just one of them. Specialist damp treatment company Core Conservation were engaged to survey the building and proposed the Aquapol non-invasive system. Nestling in the heart of the historic Norfolk market town of Swaffham, the beautiful Grade Two-listed Methodist Church has recently been renovated to offer state-of-the-art resources to people of all ages and interests in a bright and welcoming building. The transformation has been accomplished in no small part through the collaboration of two specialist church suppliers – Cunnings Recording Associates and Fullers Finer Furniture – in conjunction with the building contractor H Smith and Sons of Honingham. 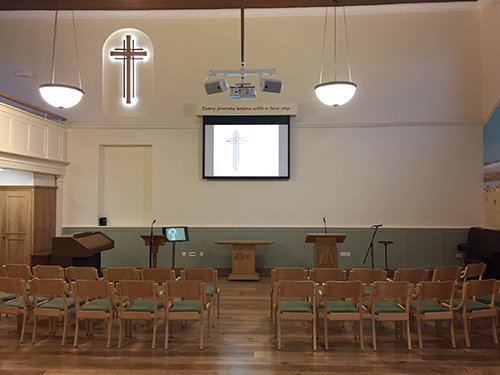 Walk into Swaffham Methodist Church today and you enter a contemporary and flexible space, exquisitely modernised to blend the best of old and new, through bespoke furniture and restoration work provided by Fullers and a quality audio-visual system installed by Cunnings. The Parish Church of St John the Baptist in the village of Somersham, near Huntingdon, stands on a site which is thought to have been used for Christian worship since the second half of the 7th century. The current building itself dates from the latter part of the 13th century and was probably built by one of the bishops who lived in the Bishops Palace, which was sited only a few hundred yards from where the church now stands but has sadly disappeared.